Called the Hubble Ultra Deep Field, the exposure reveals the first galaxies to emerge from the time after the Big Bang when scientists theorize the first stars reheated the cold, dark universe. (SPACE.com ) -- Astronomers using the Hubble Space Telescope (HST) unveiled the deepest look into the universe yet, a portrait of what could be the most distant galaxies ever seen. The new image, called the Hubble Ultra Deep Field (HUDF), includes objects that until now have been too faint to be seen and includes ancient galaxies that emerged just 700 million years after the Big Bang theory from what astronomers call the "Dark Ages" of the universe. "This image is the deepest view in the visible that we've ever taken, where an object about as bright as a firefly on the Moon would be visible," said Massimo Stiavelli, of the Space Telescope Science Institute (STScI) in Baltimore and the UHDF project leader. Stiavelli said the new image is six times more sensitive than previous deep sky surveys and four times better than even Hubble's last faraway looks, the Hubble Deep Fields (HDFs), taken in 1995 and 1998. "It has these extra colors with extra red shifts, which leads you to the end of the Dark Ages, something you couldn't do with the HDF," he added. The HUDF field contains an estimated 10,000 galaxies in a patch of sky one-tenth the diameter of the full moon located in the constellation Fornax, a region just below the constellation Orion. Hubble took one million seconds to take the HUDF, which appears in an area of the sky that appears largely empty if observed by ground-based instruments. This new view is actually two separate images taken by Hubble's Advanced Camera for Surveys (ACS) and the Near Infrared Camera and Multi-object Spectrometer (NICMOS). The combination of ACS and NICMOS images will be used to search for galaxies that existed between 800 and 400 million years after the Big Bang. But it's the NICMOS instrument that will reveal the farthest galaxies ever seen, because only it can detect light stretched past the visible, far into the near-infrared spectrum. Astronomers can tell how old a galaxy is by measuring the light it emits, specifically the amount of light that has been shifted toward the red end of the spectrum. The higher red shift a galaxy has, the more distant it is and the earlier it existed in the universe. Hubble researchers are confident their new image contains galaxies whose light has been stretched to a red shift of 6 or more. STScI researchers said there's even a good case that it contains ancient galaxies of red shift 12, which would place them about 300 million years after the Big Bang. Mario Livio, head of the Institute Science Division at Space Telescope Science Institute, says that if red shift 12 galaxies are indeed in the image, they will be found soon. "It could happen this afternoon," Livio said in an interview prior to the Hubble announcement. "That might be stretching it a bit, but it will be easy." Stiavelli, head of ultra deep field observations, said that finding a red shift 12 galaxy will be important because it will be done not with a gravitational lens, but "by brute force." The ACS field is studded with a wide range of galaxies of various sizes, shapes, and colors. In vibrant contrast to the image's rich harvest of classic spiral and elliptical galaxies, there is a zoo of oddball galaxies littering the field. Some look like toothpicks, others like links on a bracelet. A few galaxies appear to be interacting. These oddball galaxies, that existed 800 million years after the Big Bang, chronicle a period when the universe was chaotic, when order and structure were just beginning to emerge. "The images will also help us prepare for the next step from NICMOS on Hubble to the forthcoming James Webb Space Telescope. The NICMOS images reach back to the distance and time that Webb is destined to explore at much greater sensitivity," explained Rodger Thompson of the University of Arizona and the NICMOS principal investigator. The Big Bang theory holds that the universe started with an immense explosion and that the universe then cooled and became a place of darkness, lacking stars and galaxies. About 300 million years after the Big Bang, stars and galaxies began to form and that would be the limit of the physical universe. The entire HUDF was observed with the advanced camera's "grism" spectrograph, an instrument used to measure distances to these distant objects. "The grism spectra have already yielded the identification of about a thousand objects. Included among them are some of the intensely faint and red points of light in the ACS image, prime candidates for distant galaxies," said Sangeeta Malhotra of the STScI and Principal Investigator for the Ultra Deep Field's ACS grism follow-up study. 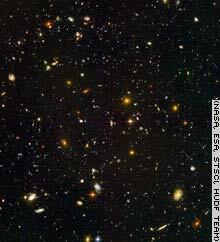 "Based on those identifications, some of these objects are among the farthest and youngest galaxies ever seen. The grism spectra also distinguish among other types of very red objects, such as old and dusty red galaxies, quasars and cool dwarf stars," she said. The ACS picture required a series of exposures taken over the course of 400 HST orbits around Earth from September 24, 2003, to January 16, 2004. The size of a phone booth, ACS captured ancient photons of light that began traversing the universe even before Earth existed. Photons of light from the very faintest objects arrived at a trickle of one photon per minute, as opposed to millions of photons per minute from nearer galaxies. Astronomers are eager to see the Hubble receive a stay of execution in the form of future servicing missions by NASA's space shuttles to extend the telescope's lifetime. Adam Riess, a supernova researcher for STScI, said an extension could help astronomers find supernova early in the universe's lifetime. "There are no supernovae in this deep field, but the results show that supernova in the early universe could be found if Hubble could be extended," Riess said. "Those could provide valuable insight into dark energy and fate of the universe." The STScI is operated by the Association of Universities for Research in Astronomy, Inc. under contract with NASA's Goddard Space Flight Center, Greenbelt, Maryland. The HST is a project of international cooperation between NASA and the European Space Agency.